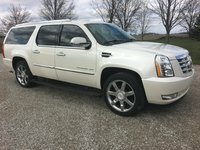 CarGurus has 11,427 nationwide Escalade listings starting at $1,999. The name “Cadillac” conjures images of power, leather, luxury and even opulence. Big and brash, the 2012 Cadillac Escalade fits right in with these images. With its bold styling, 22-inch chrome wheels, V8 power, posh ride, three rows of seating and over-the-top amenities, this jumbo-size luxury SUV defines road-worthy decadence. Cargo capacity is a somewhat crimped 109 cubic feet, but leather is standard across the lineup, and power is strictly V8, thus gas mileage, though allegedly improved, is still nothing to write home about. In any case, all this can be had for a base MSRP of just under $63,500. Sure, the Infiniti QX56, Land Rover LR4, and the Mercedes-Benz GL-Class might be more utilitarian than the Caddy, while the Porsche Cayenne and the Range Rover Sport might offer a tad more driving satisfaction, but few of these luxury utes boast the cachet of a Cadillac. For 2012, the Escalade is once more expected to be offered in four trims, the Base, lower-midlevel Luxury, higher midlevel Premium and the flagship Platinum Edition. Additionally, Caddy’s luxury ute is also available in a Hybrid version that probably won’t recoup much of its hefty initial cost, even in the long run, but might at least make a minute difference to the environment. Nonetheless, Hybrid versions will likely be further divided into Base and Platinum Edition sub-trims. All Escalade trims, meanwhile, are delivered with standard rear-wheel drive (RWD), with all regular trims available with full-time all-wheel drive (AWD) and Hybrids available with a part-time, on-demand four-wheel drive (4WD) system. Though this hulking SUV’s lineup is assumed by most reviews to be essentially unchanged from 2011, rumors are flying that the next-generation Escalade could, possibly as early as 2013, boast GM’s popular Lamda unibody construction for a ride that glides from auto-leveling plush to downright sublime. Handling characteristics, never a strong point in big sport utes, are also claimed by the automaker to be significantly improved with the sedan-like unibody chassis. In addition to new underpinnings, rumors are also circulating of a new, more powerful and fuel-efficient 4.8-liter DOHC, direct-injected V8 engine (euphemistically termed the “Ultra”) to replace the venerable Northstar V8, which is doubtless reprised in the 2012 lineup that’s expected to be on sale by midsummer. At the moment, however, it’s anticipated that the regular-powered 2012 Escalade will again pack the standard 403-hp 6.2-liter Flex Fuel (FFV) V8 and 6-speed shiftable automatic transmission. A respectable 417 lb-ft of torque means this brutish SUV can tow up to 8,100 pounds with the proper equipment, though mileage is a wallet-slapping 14 mpg city/18 highway in RWD trims and 13/18 with AWD versions. Adding insult to injury, the current V8 is recommended to use only premium unleaded gasoline, though FFV capability allows the use of ethanol-based fuel where available. Finally, AWD Escalade trims feature a viscous center limited-slip differential. The 2012 Escalade Hybrid is expected to stand pat with its standard 6.0-liter hybrid V8 engine that combines with a continuously variable transmission (CVT) and a pair of 60-kilowatt electric motors for 332 hp and 367 lb-ft of torque. Also packing FFV capability, the Escalade Hybrid uses regenerative braking to help recharge its battery pack and can accelerate up to 30 mph on electric power alone. Four fixed gears incorporated into the CVT help the Hybrid version tow up to 5,600 pounds with the proper equipment, while cylinder deactivation at highway speeds helps the hybrid V8 get an estimated 20/23. Electronic hi-lo gear selection, auto-locking hubs and a mechanical center differential govern the Hybrid’s available 4WD system, while all 2012 Escalade trims also boast a standard rear locking differential. One final note: Expect the 2012 Escalade Luxury, Premium and Platinum Edition trims to once again be cushioned by a standard active damping suspension that’s expected to be optional on the Base trim. Appearance features and cabin amenities in the Escalade lineup have traditionally been borderline decadent. The 2012 version should be no different. Look for the conventional Base trim, for instance, to sport standard 18-inch aluminum wheels, a roof rack, side-steps, heated, power-adjustable and folding outside mirrors with reverse tilt, trailer-towing equipment, and a power liftgate on the outside, with standard leather upholstery, simulated wood and simulated alloy cabin accents, and a leather and simulated wood steering wheel draping the inside. Heated, power-adjustable front seats will likely complement heated, reclining second-row bucket seats, with tri-zone, separately controlled auto-climate control blessing all three rows. Cruise control, a Driver Information Center with 8-inch LCD screen, rear parking sensors, a rear-view camera, and a power-tilting steering wheel, as well as remote engine start, a universal remote garage door opener, power windows and remote keyless start should all remain standard for the Base trim, as should memory for two drivers' settings. Techno-gizmos and entertainment will likely come complements of standard Bose premium audio components with an MP3-compatible single-CD player, ten speakers, 5.1 surround sound, XM satellite radio, iPod interface, memory-card-activated navigation and Bluetooth-enabled OnStar Directions and Connections technology. Escalade Hybrid trims should again escalate things a bit with standard 22-inch chrome alloy wheels. The amped-up Escalade Luxury trim is once more expected to add standard 22-inch 7-spoke wheels, heated and cooled front seats, a heated steering wheel, power-tilting sunroof, and power-folding second-row seats to the list, while the Premium likely will tack on power-retractable running boards and rear-seat DVD entertainment. The 2012 Escalade conventional and hybrid Platinum Editions ought to ratchet standard cabin features into the realm of the divine with upgraded leather, leather-trimmed dash and door tops, heated and cooled cupholders and an upgraded dual-screen rear DVD entertainment system. With so many standard amenities, it’s understandable that options across the lineup will again be pretty much limited to bench second-row seating (for eight-passenger capacity) and an engine block heater. The Premium trim’s standard rear-seat DVD system should be available to the Luxury trim, however, and the Luxury’s standard active damping suspension ought to be available with the Base trim. Size and heft matter in keeping occupants of the Escalade safe, but expect the usual plethora of standard safety features to return for 2012. Four-wheel antilock brakes (ABS), traction and stability control, front side-mounted airbags and three-row head airbags should once again headline this big ute’s safety equipment. Daytime running lights, front fog/driving lights, turn-signal-integrated mirrors, high-intensity discharge (HID) headlights, post-collision safety systems and OnStar emergency services with stolen vehicle tracking also are expected to come standard across the lineup. The Luxury trim and higher mount auto hi-lo-beam headlights, while the Platinum Edition should once again boast unique standard LED headlights. Owner complaints about the 2011 Escalade and Escalade Hybrid lineup include mileage figures that aren’t as advertised, third-row seats that must be removed for maximum cargo space, rather stingy cargo space and the Hybrid’s hefty pricetag. Though mileage should improve with the proposed Ultra V8, a loose suspension, somewhat noisy cabin and a distressingly harsh ride with the standard 22-inch wheels on the higher trims keep the Escalade from achieving true greatness. On the positive side, owners are willing to overlook the quirks in admiring this snazzy Caddy’s profile, posh and power. What's your take on the 2012 Cadillac Escalade? 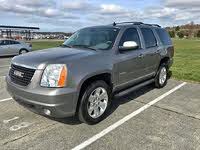 Users ranked 2012 Cadillac Escalade against other cars which they drove/owned. Each ranking was based on 9 categories. Here is the summary of top rankings. 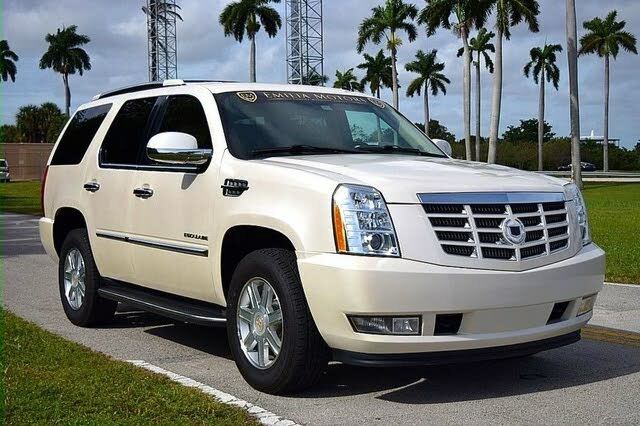 Have you driven a 2012 Cadillac Escalade? No, I do not own a cat.